A leader in electronic destruction and recycling, eDR’s cutting-edge, disk destruction technology is the most efficient, portable disk destruction solution on the market. eDR’s corporate vision is that recycling products should be safe, simple, and secure. Based on that principle, the Hard Disk Crusher has evolved as the #1 physical disk destruction product on the market today. 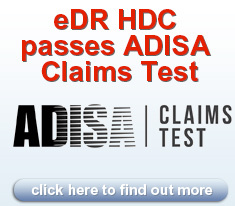 eDR stands behind its products and service, and strives for 100% customer satisfaction. The Hard Disk Crusher is currently used worldwide by privately held and public companies, Federal Agencies, Defence installations, universities, asset retirement companies, and non-profit organizations. Proper decommissioning of corporate data can help your company avoid lawsuits and decrease its liabilities. In order to comply with information security laws and regulations, all data requires proper decommissioning. Physical data destruction is secure data destruction. Non–compliance of the relevant laws could lead to anything from job loss and career limitations to expensive financial penalties. If you're a Chief Information Officer, or a Chief Information Security Officer, you won't want to take the risk. Because of the powerful operation of the disk crusher, physical hard drive destruction is guaranteed and immediately obvious. There is no doubt the data is destroyed because you can see every stage of the operation and the crushed drive afterwards. In less than 10 seconds, the motor is punched out and the disk platters are torn, rippled and contaminated making any kind of data retrieval impossible. The drive is beyond use and the disks will not spin up on the damaged motor. Even if the disks were fitted to another motor the ripples and contamination on the magnetic substrate covering the surface of the disk make data retrieval impossible.